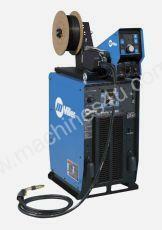 The one-package pipe welding solution for both field and shop fabrication. Multiprocess capabilities include new patented RMD Pro and Pro Pulse which are optimized for steel and stainless steel pipe. Auto-Line allows for any input voltage hook-up (190–630 V) with no manual linking. Compensates for voltage spikes and drops within the entire range. Use conventional or advanced MIG (GMAW) processes without making any hardware changes. Just select program and weld. Wind Tunnel Technology circulates air over components that require cooling, not over electronic circuitry, which reduces contaminants and improves reliability. Fan-on-Demand cooling system operates only when needed and reduces amount of airborne contaminants pulled through machine.